The best email app to easily organize your Gmail, Outlook (Hotmail), AOL and Yahoo accounts. Regardless of your email address, you can experience the Yahoo Mail app's beautiful design, easy-to-use interface and lightning fast speed. Plus, Yahoo Mail offers 1000 GB of free cloud storage, so you never have to worry about space again. ● SIGN UP WITH ANY ACCOUNT - Works with non-Yahoo email addresses, including Gmail, Outlook and AOL. No Yahoo email address required. ● CALLER ID - Not sure who is calling you? Yahoo Mail can automatically display mail contacts for incoming callers. ● GET CREATIVE - Make sure your emails stand out with animated photos and artist-designed stationery from Paperless Post. ● NEVER LOSE AN EMAIL - Keep all of your emails with 1000 GB of free cloud space. 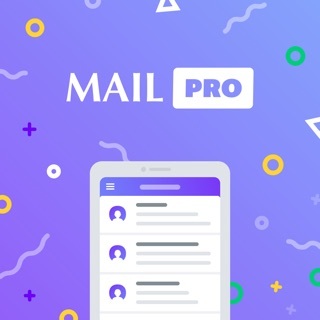 GET YAHOO MAIL PRO on mobile - Get ad-free mail on Yahoo Mail for iOS and priority customer support. ● To see all the new features, upgrade your device to iOS11 or later. ● Optimized for use with VoiceOver. We update the app regularly to make your email experience the best it can be! This release includes bug fixes and stability improvements. I had to write another review for this app because I know it’s popular to bash on yahoo. I have been using a number of mail apps, gmail, mail, outlook (with office 365) and yahoo mail. Gmail is confusing and I never really liked it. Mail is nice for the IOS integration but basic. Outlook has been my go to power mail app because of the exchange integration, but there are things about yahoo mail I like better than outlook. I can easily create sub folders in yahoo mail. I don’t have that ability in the outlook app or its so unintuitive to find. I love how I can easily select all mail for a day, or past day or a week and fling through it all unchecking valid emails and mass deleting everything else. This seems basic but the UI aspect of doing it in yahoo mail is faster and easier than outlook. Can’t figure out how to do such basic things in gmail. I also find the UI in yahoo mail isn’t so minimalist that you can’t figure out how to do simple things like clearing out your spam or deleted items folder. I do a lot more jumping back and forth from within a folder to the main mail view in outlook than yahoo mail. Lastly unlike other mail apps I mentioned, I love that yahoo mail has good color pop to their themes with good contrast and readability. I don’t like the muted minimalist faded colors in outlook and gmail. Oh one last thing. This app starts up much faster on my iphone than outlook. Hind sight being what it is along with reality, I began with AOL when dial up was the only option and Yahoo came along with the music player in tow. The only way I was reasonably capable of keeping My data without purchasing hardware to back-up My data was Yahoo. I do wish the music player would have stuck around which would have, at least, kept a record of the songs I've forgotten I liked (evolutionary record purposes). I always liked not having to go through multiple contracts just to listen to a CD (the benefits of fair business practice is not forcing Your "clients" into a monopoly type contract and sole inlet of music [I.e. tuner, CD player, tape deck, tape CD, etc.). If house music didn't come along I would be musically deficient due to the "lustre" being surgically removed over the past 25 years. Nevertheless, as other email sources have consistently remained similar forcing the consumer to individually fork through all the "junk" type mail (not referring to the mail as junk or trash but for a lack of a better term for the plethora of mail ads) Yahoo has evolved gratefully. Hmmmmmmmmm. . . . The Yahoo music player when it was void of being able to purchase music. . . . . Good idea. Deleted app finally. I linked yahoo mail through gmail. I highly recommend. More flaws to report with yahoo app. I am using an iPhone X. Mail would disappear from the inbox if I clicked on a new mail notification. Would take hours to appear back. If I used the search to find an old email it would find the email and when I click on it the email it would just load and load an nothing would appear. I finally had to forward the email to gmail so I could view it. Also why should one have to pay to remove annoying ads which aren’t even applicable to what I am interested in. Worst app ever. Minus one star for not being able to change sounds for incoming & outgoing mail. If you have an iPhone you are stuck with the generic default notification and can’t change it at all in the settings of the app or in the settings for the iPhone. Second minus star that they show irrelevant ads in the top of the inbox. I don’t want to pay a dollar a month to get rid of it. If you want people to use your app rather than the default mail setting in the iPhone then get rid of that like gmail and outlook have in their free versions. Update to the developer’s reply. That is untrue. Both the Outlook and Google mail apps. let you change sound notifications within the “settings” of the widget themselves and not in the actual Apple settings. Hello, unfortunately we do not control the notification sounds. That is controlled by your device aka Apple. Most apps don't allow you to change the sound. We are definitely working with Apple to hopefully get this changed. **Thanks for the additional info. We will share this with the team and see what we can do!